A steel carriage powers up the tree-studded slope of a Mediterranean cliffside, and miles below, a coastal city naps in the warm light of a waning sun. I’m not here for sightseeing though; nothing so innocent as that. Dishonored 2 takes place 15 years after the events of its predecessor and players assume the role of either Emily Kaldwin, the young girl from the first game who now rules as Empress of the Isles, or returning protagonist Corvo Attano, Emily’s Royal Protector. Emily has been overthrown by Delilah, the superpowered antagonist from Dishonored’s Knife of Dunwall DLC, and now Emily’s hunting down those who conspired against her. In the demo we got to play at a community event in New York City, she’s come to take out Grand Inventor Kirin Jindosh, who has locked his competition, returning character Anton Sokolov, in the bowels of his mountain fortress. Jindosh’s “Clockwork Mansion” is nestled between thick, cherry-colored trees on a mountain that overlooks the city, and after a carriage ride up the rocky slopes I gaze across the expansive vista. The visual style is instantly familiar and yet noticeably improved over its predecessor. The cityscape is speckled with rooftops, and an ocean spray wafts in from the harbor. Arkane’s vision for Dishonored is a “painting in motion”, and it’s been able to bring this vision to life even moreso for its second go-around with the franchise. 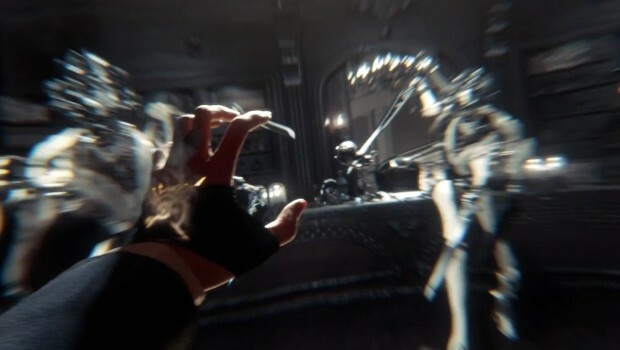 The original Dishonored was built using Unreal Engine 3, but for the sequel Arkane rewrote 95 percent of the id Tech engine to serve its purposes — what they call the “Void Engine”. This has allowed them to make each space denser and more vertical. I absorb the scenery from the edge of a decrepit stair for a little while longer, and then with resolve, I enter the Clockwork Mansion. Each level in Dishonored 2 bears a unique gameplay mechanic, from a city district grieved by spontaneous, vision-impairing dust storms to a ruined manor in which you can travel between the present and three years in the past. In our demo, the gimmick is a collapsible mansion with floors and walls that tuck and fold and transform at the press of the button. I’ll have to manipulate the rooms to find Sokolov and, later, Jindosh. In the lobby, I’m presented with one of these room-changing buttons, but this is Dishonored — and there’s always another way in. In this level, a new piece of gear lets you travel seamlessly between the present and three years in the past, giving fans an entirely new way to be creative with their powers. Instead of pressing the button, I pull out my crossbow, a returning piece of gadgetry from the first game, and fire a shot at the pointed glass ceiling above me. The pane shatters, and I use Emily’s Far Reach ability to pull myself above the room and into the space beyond. In the game’s opening mission, you can choose to play as either Emily or Corvo, and you’re locked to your choice for the rest of your playthrough. There’s incentive here to play the game twice; Arkane has designed both Emily and Corvo to feel unique in the game space. For example, Corvo has the Blink ability that lets him traverse long distances as if teleporting. Emily’s Far Reach ability allows her to scale the same distances, but enemies can see her as she travels. This makes Blink invaluable for tricky combat situations when you might be overwhelmed with enemies, but if playing as Emily, you’ll want to be a little more calculating when you engage an enemy. Arkane further differentiates these characters by making them fully voiced protagonists, a feature that was noticeably absent from the first game, but was experimented with for Daud, the main character from the studio’s Knife of Dunwall DLC. Having voiced protagonists allows Arkane to tell two very different stories. Emily is an empress pushed out of her home, and Corvo is an aged man returning to his conflicted homeland. Their characters are informed by how they respond to the game world, such as Corvo reminiscing of an early fishing expedition when he sees a giant squid statue in Jindosh’s lobby. I didn’t care about Corvo in the first game, but his gruff and confident demeanor is growing on me. Jindosh is aware of the disturbance in his home, and he begins to taunt me over a loudspeaker, inviting me to an audience with him. I could go speak with him like he wants, but my Emily does things on her schedule. Instead, I drop into a gap in the floor, and Jindosh lauds me for finding the “space behind the walls”. Clockwork soldiers, Jindosh’s patent robot sentries, lurk in the twisting network of passages beneath the floors, but I don’t engage them. Not yet. Instead, I use Far Reach to skirt around one, and dodge through a window into a lavish hallway decorated with [use description]. Jindosh knows I’m there — he tells me he can sense my weight on the floorboards — and before I can react, the room transforms, and an Arc Pylon appears in the center of the floor. It’s a nasty contraption from the first game that eviscerates enemies that come too close — and it’s the perfect opportunity to play with some toys. I use Shadow Walk, a new ability in Dishonored 2, which turns me into a shadowy form that stalks quickly and silently across the floors. My target is a lonely guard who I knock unconscious by pressing the bumper button, but I’ve accidentally alerted other guards — and a Clockwork Soldier hidden behind a nearby wall. Emily’s arsenal is similar to Corvo’s from the first game — she has a pistol with regular and explosive bullets, a crossbow, Arc Mines (like miniature Arc Pylons), and more, but for this dance I select the pistol with explosive bullets. The guards fall quickly, and the Clockwork Soldier collapses to the ground in a splash of nuts and bolts. Around the pile, guards are bleeding out, and I know I’ve just secured an insanely high Chaos Rating at level’s end. The Chaos system returns in Dishonored 2, which Smith cites as being one of the major areas the team at Arkane wanted to refine from the original game. In the first entry, pointing the Heart tool at NPCs revealed their secrets, allowing the player to make an informed decision about who to kill and who to spare. The issue, Smith explained, was that the Chaos value for each NPC wasn’t conditional on their morality. This made the Heart an ineffective tool for decision-making, but this isn’t the case in Dishonored 2. For the sequel, NPCs are randomly assigned a morality at the beginning of each level, Smith says. If you kill a character with higher morality, you’ll receive less Chaos than if you kill a character with low morality. And your Chaos Rating, ultimately, decides your ending. He explained that in the original, if a player killed fewer than 20 percent of NPCs, they were rewarded with the “good” ending, and for greater than 20 percent, the “bad ending”. But in Dishonored 2, Arkane has crafted each ending to be specific to your actions in the game, with nearly 20 variations. But I’m not working toward a happy ending right now. After cutting down the butler, I use Far Reach to vault across a damp chasm. Nearby is a waiting room that I must have shifted down here at some point, and its two posh occupants are standing on a balcony overlooking a labyrinthine maze — a test chamber for Jindosh’s sinister machinations. The user interface indicates that my objective is just below — Jindosh has trapped Sokolov in the maze. Clockwork soldiers can see both in front of and behind themselves, posing a new challenge to even the most clever players. I could easily cut down the civilians, but first I use the Heart to reveal their secrets. The man makes his friends happy, the Heart tells me, but the woman is a jealous gold digger. I decide not to engage, pass behind a curtain wall, and descend a steel staircase into the maze. Smith says that “emergent gameplay” is a critical component of the game’s design, and my mind wanders imagining what roles those civilians might have taken in another playthrough. Below, the maze mimics the mechanics of the house; panels set into the floor cause the walls to raise or lower, but before I can address the puzzle, I’m confronted by a Clockwork Soldier. I’m vicious this time, barraging the droid first with cuts from my sword then explosive shots from my pistol. A shot shatters its armor, exposing a weak spot just below the surface, but regardless, I default to Shadow Walk to trump its counter with a crushing blow. I spend a few minutes toying with the maze, finally figuring out the correct order to press the panels so as to open Sokolov’s chamber. When I find him, he’s laying weakly in a bed, and when I reach out to him, I pay attention to the impressive level of detail and expression in his face. It’s clear that Arkane has aggressively pursued a denser, richer world this time around. Sokolov slips into unconsciousness, so I throw him over my shoulder and am quickly prompted to return him to the carriage I arrived in. But this is a Dishonored game, so I ignore it and stash him inside an elevator shaft. I’ll come back for him later — it’s time to take out Jindosh. Arkane’s play-your-way approach to level design is exhibited like one of Jindosh’s creations in the laboratory where I find the Grand Inventor. Jindosh roams around a high balcony protected by two Clockwork Soldiers, and there are a number of ways I can take him out. The non-lethal approach involves knocking Jindosh unconscious, hooking him up to an electroshock machine, and tracking down the power sources in order to fry his brain. The alternative gets to the point — dispatching the droids and slaying Jindosh in combat. At this point in my demo, a representative from publisher Bethesda informs me I’m running low on time, so I choose the latter. Jindosh falls to my feet — one of Emily’s conspirators is dead. The demo ends with Sokolov and I back in our little steel carriage. We may be celebrating a small victory, but there’s much more work to be done. And you’re never really done in a Dishonored game — particularly the sequel. Arkane has developed a game that’s loaded with new secrets to stumble upon, emergent gameplay, and a seemingly infinite number of creative possibilities. And now with two fully voiced protagonists, an exciting new setting, and an improved, more powerful game engine, I don’t need Dark Vision to see that there will be plenty to keep us busy when Dishonored 2 launches next month.